← Resurrection: Truth or Deception? August 26 marks the 106th anniversary of an Albanian-Indian Catholic nun and missionary that changed the world. Devoted to charitable work with the poorest of the poor, Anjese Gonxhe (little flower) was became known to the world as Mother Teresa of Calcutta. In typical Teresa style, she considered August 27, the day she was baptized, as her true birthday. By age 12, she was convinced that her life should be handed over to a religious life. At the age of 18 she left her home in Skopje, Macedonia, to join the Sisters of Loreto in Ireland where her first task was to learn English in order to serve her religious order in India. Her first desire for a new name as a sister of the convent was Therese, after Therese de Lisieux, patron saint of missionaries. However, she was informed that another nun had made the same choice before her, so she happily settled for the Spanish version, Teresa, and took her vows in 1931. She first served as a teacher in an India devastated by the Bengal famine of 1942 that brought death and misery to the to the city of Calcutta. The famine was soon followed by political violence that was particularly oppressive to the poor. These were the people she wanted to serve, but she would have to leave the convent to do so. 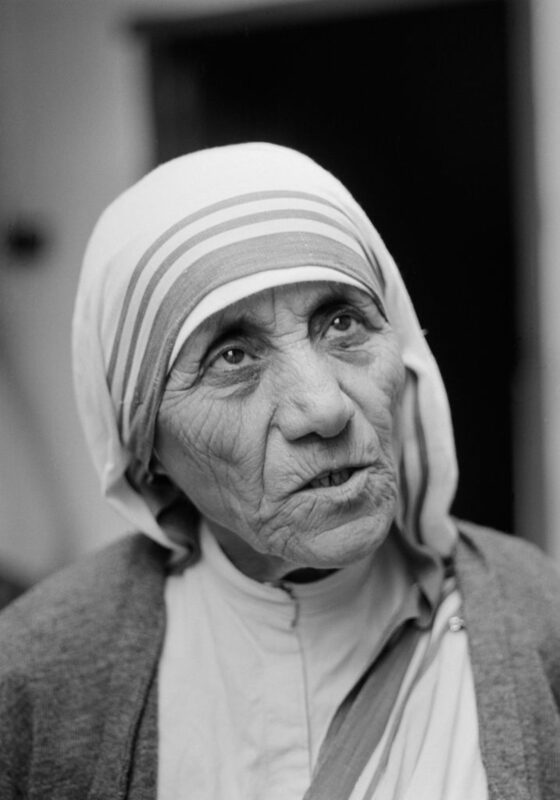 In 1948, she became simply Mother Teresa, replacing her nun’s habit with a simple, white cotton sari with a blue border. A year later, through her example, young women joined her work, leading to the foundation of a new religious community, Missionaries of Charity. While looking for a home I walked and walked till my arms and legs ached. I thought how much they (the poor) must ache in body and soul, looking for a home, food and health. Then, the comfort of Loreto [her former congregation] came to tempt me. “You have only to say the word and all that will be yours again”, the Tempter kept on saying … Of free choice, my God, and out of love for you, I desire to remain and do whatever be your Holy will in my regard. I did not let a single tear come. She opened a hospice for the dying and those with leprosy that led to clinics throughout India. She took in endless numbers of homeless and orphaned children. Her work encouraged expansion to South America, Italy, Tanzania and Austria, and later even to the United States and dozens of other countries. Priests begged to join the movement of caring for poor souls and by 1984 the Missionaries of Charity combined with resources from the priesthood with almost 450 brothers and 5,000 sisters worldwide. By blood, I am Albanian. By citizenship, an Indian. By faith, I am a Catholic nun. As to my calling, I belong to the world. As to my heart, I belong entirely to the Heart of Jesus. After a heart attack in 1983, she was never truly healthy again, even with a pacemaker. In 1996 she broke her collarbone, was stricken with malaria, and fought heart failure. She died on September 5, 1997. At the time, her 610 missions were active in 123 countries. She is the epitome of charity and service to the poor, the sick, and the disadvantaged and remains today as the highest example of service to humanity. Many books and articles have been written about the life, suffering and service of Mother Teresa. Lectio author, Robert Garrity, Ave Maria University, has written an insightful, beautifully crafted proposition that Teresa, through God’s divine intervention, originated a distinctive form of theological mysticism defined as both seeing Jesus Christ and serving Jesus Christ in the poorest of the poor. 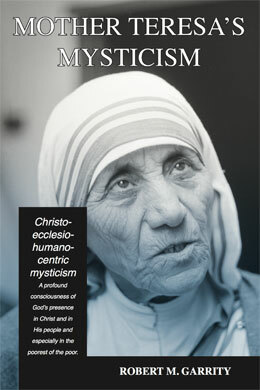 In Mother Teresa’s Mysticism: A Christo-Ecclesio-Humano-centric Mysticism, Fr. Garrity suggests that God’s gift to Teresa of this experiential knowledge of Christ’s presence in today’s world has the power to be a significant source of theological and pastoral renewal in the Church of the twenty-first century. Happy Birthday, Saint Teresa of Calcutta! Thank you for your inspiration, life, and devotion. Pray for us! This entry was posted in Published Books, Religious Studies and tagged Christo-Ecclesio-Humano-centric Mysticism, Mother Teresa, Mother Teresa’s Mysticism, Saint Teresa of Calcutta. Bookmark the permalink.